Those little tofu pyramids are not only adorable, but also delicious…tofu can be unappealing for some people, it is certainly bland as an ingredient, but when slightly spiced up with herbs and spices, it’s simply delicious. What I like about tofu it’s that it’s light but nutritious. It’s a very versatile ingredient and can be prepared in many different ways so let’s not be afraid to play with it. 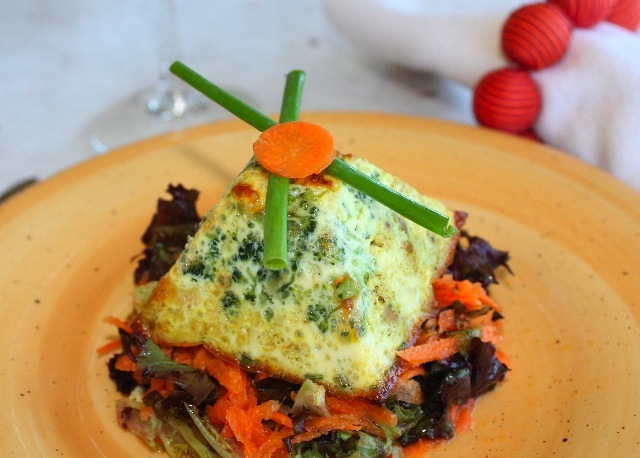 Those pyramids as I call them (actually could be called flan as well) can be served on a salad as an appetizer or for vegetarian as a “meat” replacement served with vegetables and/or a grain as a main course. I bought the silicon “pyramid” molds in France. I’m sure you can find them in the US, maybe not in that shape, but any other shape would work too, such as muffin molds. Saute shallots in olive oil, then add mushrooms, cook until water has evaporated. Add tofu and curry, salt and pepper. Mix well. Remove from pan and place in a mixing bowl. Cook broccoli in water for a few minutes, until it’s cooked but still firm. In another mixing bowl, mix eggs, milk, cream and chives, salt and pepper. Mix well. Take your silicon molds and start filling them with broccoli, then add mushroom, curry mixture. Fill until the top of the mold, compressing the mixture. Fill molds with milk, cream mixture. Place in a pre-heated oven at 370F for about 20-30 minutes until the pyramids are cooked all the way through and a little browned on top. Serve hot on a bed of salad of your choice. This entry was posted by silvia on March 19, 2009 at 2:04 pm, and is filed under Appetizers, Side Dish, Vegetarian - dairy. Follow any responses to this post through RSS 2.0.You can leave a response or trackback from your own site. Thank you so much! Living in the US, I try to get the most authentic flavors with ingredients you can find here. If you want some specific ideas or particular recipes, please let me know, I will be happy to help. Could you please tell us what tofu consistency you used here – fresh(silken, firm, or dried one??) or processed?